A couple months ago, Alexa, DJ, Kristin and I were in The Strand and we got super nostalgic over the paranormal romance books we used to read and love. We jokingly said we should have a book club to revisit (or in some cases read for the first time) said books and one extensive spreadsheet later, here we are with one read under our belts! 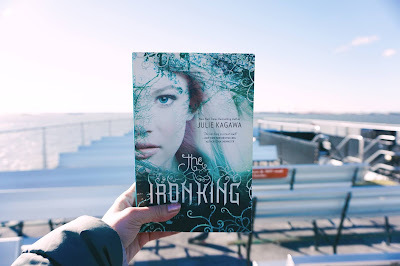 In January, we read The Iron King by Julie Kagawa which was a re-read for DJ and I but new for Alexa and Kristin. I was especially excited to re-read these because I hadn't read them since 2011 and at the time, they were my absolute favorites. As in, I re-read my favorite parts constantly and Prince Ash had book boyfriend status. So seven years later, did The Iron Fey series hold up? Yes! Albeit, not perfectly but pretty damn close. The plan was to only read the first book but within a span of 4 days I read the 4 books in the series, the novella bind-up and I finally finished the last book in the spin-off which I thought I'd never get to. That alone should tell you a lot. But for those of you who don't know, The Iron King is about Meghan Chase, a sixteen year old girl who's never felt like she belonged, especially after her father disappeared ten years ago. But on the day of her birthday she finds out that the fey are real and that she has her own connection to them. The main series continues to follow Meghan as she discovers more about the faery realm, the different courts and the war waging among them, the important connections she makes along that journey and finally finding her place in it all. My unwavering fondness for the series definitely played a part in my enjoying it after all these years. It made it easier for me to overlook the flaws that I didn't see back then, such as the pacing and the writing being a tad weak. But what stood out to me then still stood out to me now and it's just that I love the world Julie Kagawa created and the characters that inhabit it. They're memorable, funny and maybe a little angsty at times but they are trying to save the faery realm. And each book gets progressively better. My ratings for The Iron King and The Iron Daughter went from 5 to 4 stars while The Iron Queen still stayed a 5 and The Iron Knight stayed a 4. But The Iron Queen is without a doubt my favorite in the whole series. It was as swoony and magical as I remembered and honestly, if you have any reservations about the first book but still enjoyed it, keep going because the third book is worth it! I love that after all these years, I can still call this series a favorite and Prince Ash once again has my heart (and I adore Meghan Chase and Grimalkin). When's the last time you re-read an old favorite? Did it hold up? And if you've read The Iron Fey, do you love it as much as I do? If you're curious, here's my original review from 2011!